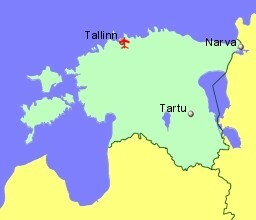 Estonia, a heavily forested country, lies south of Finland, across the Baltic Sea and has borders with Russia and Latvia. It is a relatively small, sparsely populated country with a surprising variety of landscapes. The almost 50% of the country is covered with forest, and the roads are not busy. It is also a country with plenty of history, culture and a strong tradition of music and singing. The cold winters produce plenty of snow, and the relatively flat landscape make it suitable location for cross country skiing. In summer, some of the same routes can be used for hiking or cycling. The capital, Tallinn, a popular destination, is described as a very modern city where the history is well preserved. Estonia is a member of the European Union and the currency is the Euro. Estonia is also a Schengen country. Located 4Km south east of Tallinn, on the shores of Lake Ulemiste, north west Estonia. Tallinn has a magnificent medieval old town within impressive city walls.